Not all J/C, but plenty of that too! 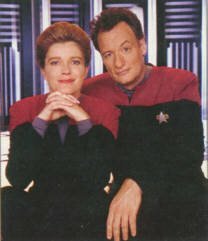 While you're there, try your hand at Voyager Trivia!! Captain Janeway and her crew discover a path that leads to home. But they receive a visit from our favorite super being, who warns them that the Alpha Quadrant may not be home, after all. What if the life that awaited them on Earth was worse than anything they endured on Voyager? Best of all, Seven doesnt save the ship or the day. Not even once! An all dialogue story. 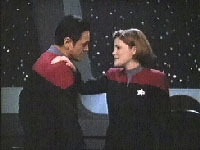 A power blackout, Janeway and Chakotay nipping at the nectar. It was a challenge. Short and sweet. Click here for the rest of LadyChakotay's stories.